If you think about it, the RepRaps and other commercial 3D printers we have today are nothing like the printers that will be found in the workshops of the future. They’re more expensive than they need to be, and despite the RepRap project being around for a few years now, no one has cracked the nut of closed loop control yet. [mad hephaestus], [Alex], and [Will] over on the Hackaday Projects site are working on the future of 3D printing with the Servo Stock, a delta printer using servos and closed loop control to build a printer for about a quarter of the price as a traditional 3D printer. The printer itself is a Kossel derivative that is highly modified to show off some interesting tech. 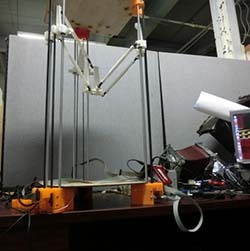 Instead of steppers, the printer has three axes controlled by servos. On each axis is a small board containing a magnetic encoder, and a continuous rotation servo. With this setup, the guys are able to get 4096 steps per revolution with closed loop control that can drive the servo to with ±2 ticks. The electronics and firmware are a clean sheet redesign of the usual 3D printer loadout. The motherboard uses a Pic32 running at 80MHz. Even the communication between the host and printer has been completely redesigned. Instead of Gcode, the team is using the Bowler protocol, a system of sending packets over serial, TCP/IP, or just about any other communications protocol you can think of. Below is a video of the ServoStock interpreting Gcode on a computer and sending the codes and kinematics to the printer. It seems to work well, and using cheap servos and cut down electronics means this project might just be the first to break the $200 barrier for a ready to run 3D printer.